Makarska, Croatia may not be the most famous dive or snorkel location in the world. Nevertheless, Croatia has become a hub for European divers in recent years. So, the Croatian coast is mainly stony – but with a good view under water! So, what is there to see? To cite just one example: Croatia is famous for the “Atrina Maura” – a mollusk with a triangular shell that is protected in the country. Fish, dolphins, whales or sharks. In the Maputaland Reservoir, one of the most beautiful natural reservoirs in Africa, you will find every marine life. Fantastic: even in small depths there is quite a lot to see. There are endless turtles along the coast! The Similan Islands are part of a nature park that is considered to be the best diving spot in Thailand. It is world famous for its coral reefs, its marine life, and its white sand beaches. A total of nine islands form the archipelago of the Similan Islands, which lie in the heart of the Andaman Sea, by boat about three hours from the mainland. Its waters are part of Thailand, even if they approach the border with Burma. Fiji is just what you have always imagined: tropical beaches, clear water with colorful fish that float between coral reefs, white beaches, and palm trees full of coconuts. The best diving time is between April and October, but you can also dive between June and August – at least if you can live with some cooler water. Here you can see a great variety of marine animals, such as sharks, manta rays or clownfish. The Great Barrier Reef is a UNESCO World Heritage site stretching 2,400 kilometers across the Pacific Ocean. It is a great place to go at shallow depth on a snorkel tour. Here there are more than 1,800 species of fish, over 5,000 molluscs and more than 125 species of sharks. In addition, you can watch soup turtles, clownfish, sea needles, seahorses, crocodiles and countless other marine life. The Spanish Medas Islands are the best place in the country to enjoy the sport of diving – thanks to the excellent conditions and the fantastic seabed. The natural protection of the archipelago makes it a perfect diving spot in almost all weather conditions. There are algae, seaweed, corals, crabs, starfish and fish – a great variety of species. Hawaii is a true diving paradise. Hanauma Bay is home to more than 450 tropical species of fish – for example the national fish of Hawaii: the Humuhumunukunukuapuaa, also known as “triggerfish”. This bay was formed as a result of a volcanic explosion, which took place a thousand years ago. Since then, the natural erosion has created a coral reef that now serves millions of marine animals as shelter. The Maldives are one of the best diving spots in the world. The connection of warm water and stable currents have created a unique environment for diving. The Maldivian archipelago stretches over 1,200 islands, which together occupy more than 298 square kilometers in the heart of the Indian Ocean. 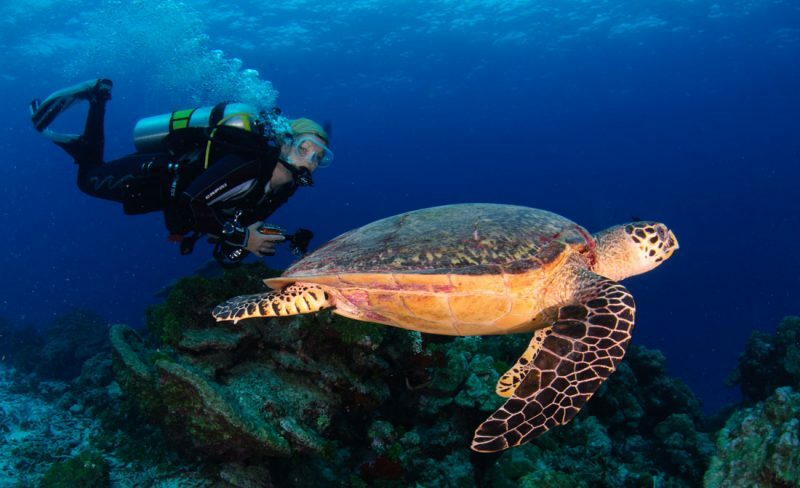 Here you can go on a diving tour together with manta rays, stingrays, turtles and many other marine animals. Porto Belo is famous for its caves, islands, wrecks, coral reefs, and unique rock formations. The incredible biodiversity and calm clear waters make this Brazilian beach one of the most popular diving spots. In the resort of Porto Belo, we recommend Bombinhas Beach, where you will find the remains of a sunken ship, the Arvoredo Biological Reserve and Macuco Island. The Bunaken National Park stretches over five small islands, located in the northwestern part of the large Indonesian island of Sulawesi. This area is largely unknown to tourists, so you can still find peace while diving and a virgin underwater world. The National Park was established in 1991 to prevent dynamite fishing and increasing pollution. Utila is well-known in the Caribbean because of its islands and islets as a dive and snorkel area. Not to mention the turquoise water and the wide variety of flora and fauna. In Utila, you can swim together with 15-ton whale sharks. The best way to see them is between March and May and from August to October. Cozumel is considered one of the best dive and snorkel destinations in the world. The island is surrounded by more than 25 reef formations stretching over 32 kilometers. In addition, the water is so clear that the visibility is up to 70 meters. Here you can observe numerous fishes and marine animals such as turtles, moray eels, sharks and many more.